“Venice has its Bellini, Puerto Rico has the Piña Colada, but Foynes will forever be the birth place of the Irish Coffee." WHEN READING ABOUT the origins of genius inventions, they often come from the most mundane, or even accidental, of circumstances. The microwave was inspired by a melted chocolate bar in one man’s trousers, and superglue was invented accidentally during efforts to make clear viewfinders for guns (then abandoned for 6 years before the inventor realised the infuriating substance might actually be useful). There’s an equally interesting, and much more charming story behind the origins of the Irish coffee, which was created due to a haphazard mix of a great entrepreneurial Clare man, a chef with a cheeky streak, and a stormy winter’s night in Limerick. Let’s start with the entrepreneur, Brendan O’Regan. In 1943, Clare man Brendan O’Regan was appointed by the government as a Catering Comptroller at Foynes’ flying boat base, which catered for passengers travelling in the aircrafts that can land on water. He was a notable figure for the Limerick area and was a huge part of its economic development for years to come, including setting up the world’s first duty-free shop at what’s now called Shannon Airport. Under O’Regan’s dynamic management, the restaurant at Foynes quickly became regarded as one of the best in Ireland. He redecorated the space to give it a ‘strong Irish character’ and sought well-educated people as restaurant staff in order to create a positive impression of Ireland. Among those that he hired was Joe Sheridan – originally from Castlederg, Co Tyrone – who, as a chef, had been recruited to run the kitchen. It was Sheridan’s blunt and confident application that won O’Regan’s approval. It was just one line long: “Dear Sir, I’m the man for the job. Yours sincerely, Joe Sheridan”. And it’s hard to imagine how the drink would have been invented if it wasn’t for that slight air of mischief and confidence to produce whatever the occasion demanded. Late one night in the winter of 1943, a flight left Foynes for New York. After flying for several hours in bad weather, the captain decided to return to Foynes to wait for safer conditions. A Morse code message was sent to the control tower to inform them of their return, and staff were called back in - including Sheridan. The passengers gathered at the Foynes restaurant weary and disappointed from the wasted trip. When asked to prepare something to warm them, Sheridan decided (you’d imagine with some degree of devilment) to put Irish whiskey in their coffee. A few weeks later, Sheridan knocked on O’Regan’s office door to show off his new beverage in a stemmed glass and topped off with cream. “How about that for eye appeal?” O’Regan was asked, and he answered, “Genius, Chef!” in a scene that’s seems tailor-made for a television advert. The drink was served to passengers at Foynes and when it closed in 1945, they were moved to the airport at what is now Shannon where the drink was served as a ‘welcoming’ beverage. In 1951, American travel writer Stan Delaplane who stopped off at Rineanna was served an Irish coffee. When he returned to San Francisco, he told his friend, Buena Vista café owner Jack Koeppler, about the drink. The Buena Vista staff tried reproducing it, but couldn’t get the cream right. So Koeppler offered Sheridan a position at Buena Vista café in 1952 and the chef accepted the job. Today and tomorrow, an aviation show and festival events at Foynes will celebrate the birthplace of the Irish coffee on its 74th anniversary. Step One: Preheat your coffee glass by filling it with hot water for 5 seconds, then pour the water out (but be careful the glass doesn’t shatter from the heat). Step Two: Add 1 teaspoon of brown sugar and a good measure of Irish whiskey into the warmed glass. Step Three: Fill the glass to within 1 cm of the brim with hot, strong black coffee. Stir well to dissolve all the brown sugar. Step Four: Carefully pour lightly-whipped cream over the back of a spoon so that it floats on top of the coffee. Step Five: Do not stir after adding the cream; optimal flavour comes from drinking the coffee and Irish whiskey through the cream. Visit the Foynes Flying Boat & Maritime Museum’s website for more information. Email “The late-night flight that inspired a chef to make the first Irish coffee”. 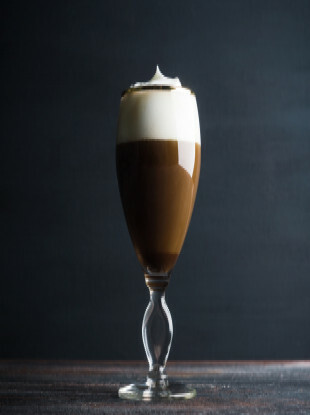 Feedback on “The late-night flight that inspired a chef to make the first Irish coffee”.